An antique woodcut engraving which was published in "The Illustrated London News" and published July 24th, 1880 with later hand colouring. The Champion Lawn Tennis Match : Mr Hartley winning the cup for the second time. More Info An antique woodcut engraving which was published in "The Illustrated London News" on 24 July 1880. Later coloured by hand. John Thorneycroft Hartley (9 January 1849 - 21 August 1935) was the only clergyman to win Wimbledon. In the final in 1880 he defeated Herbert Lawford, 6-3, 6-2, 2-6, 6-3. 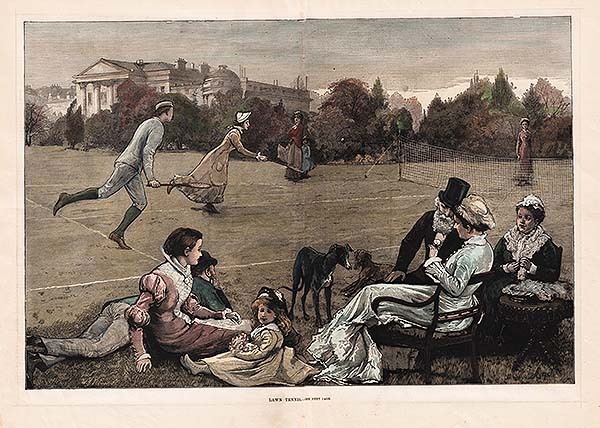 An antique woodcut engraving which was published in "The Illustrated London News" on 24 July 1880. Later coloured by hand. John Thorneycroft Hartley (9 January 1849 - 21 August 1935) was the only clergyman to win Wimbledon. 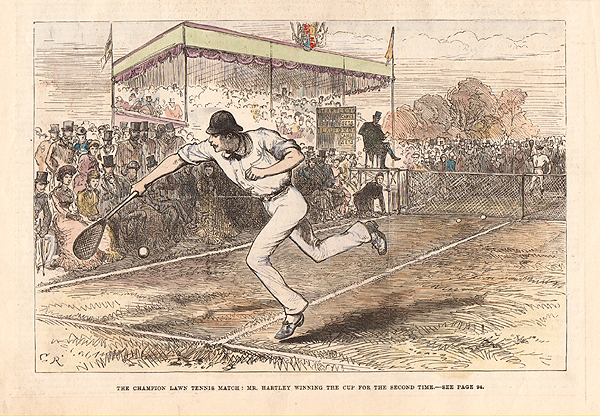 In the final in 1880 he defeated Herbert Lawford, 6-3, 6-2, 2-6, 6-3. Tennis - Miss Eileen Bennett. South of England Lawn Tennis Tournament at Devonshire Park, Eastbourne. An antique woodcut engraving which appeared in "The Graphic" newspaper. Circa 1880. The colouring is later.